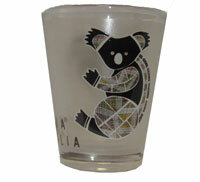 Frosted shot glass displaying Jijaka Aboriginal art of a Kangaroo and Koala. A friend works near Jijaka and he brought one of these shot glasses back to the States for me as an Australian gift. I love it!